R+R were approached by a company in India to research a replacement for a compressed air confetti delivery system. The original product used a steel welded chamber with a twist-to-release seal, to deliver a blast of air pressure through a cardboard tube full of confetti. The steel chambers were heavy and required welding and assembly by hand. The seal was problematic, requiring high pressures and a needle-based (time-consuming) pressurisation method. 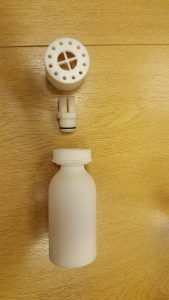 R+R used 3D model design and analysis techniques along with cutting-edge additive manufacturing, to produce working prototypes that delivered reliable repeatable results at lower pressures, and that could be pressurised by faster and simpler methods already used by the aerosol industry. This prototype design was then used to produce plastic injection moulds for mass production.